Giselle will run from you into the real world when you go in this womens plus size Evil Queen costume! 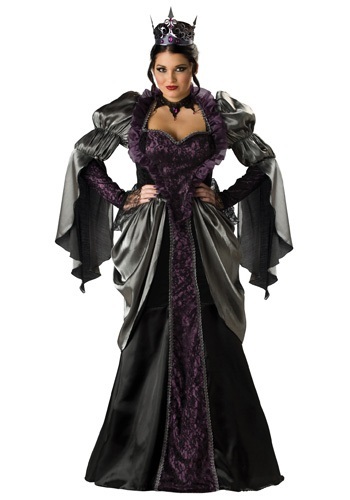 This plus size wicked queen costume includes a full length dress with an attached black petticoat, sequined crown, and lace choker. 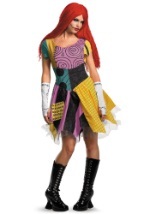 The dress is made up of various, black, silver, and purple polyester fabric. 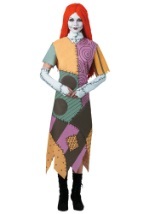 The front of the dress features purple fabric that forms in to a V-shape at the waist. Black lace covers purple fabric which transforms from a heart on the chest, to a sweeping triangular shape in the skirt of the dress. Black velvet like material also makes up the chest area. The puff sleeves are made of silver fabric that hangs down loosely at the elbow. 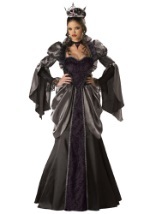 Purple fabric and black lace make up the rest of the sleeve. From the waist down, silver fabric lays over black polyester fabric. The back of the dress is made of velvet material and has a zipper to assist in easy on and off. The silver overlay goes extends to where the zipper is. The petticoat is black and is full length. The crown is made of plastic and has purple jewels and sequins attached throughout it. Velcro is attached to provide a comfortable fit. The lace choker also features purple jewels throughout and has a silver clasp. Don't forget our evil, Gothic accessories to complete your transformation!